Product prices and availability are accurate as of 2019-04-18 08:53:58 UTC and are subject to change. Any price and availability information displayed on http://www.amazon.com/ at the time of purchase will apply to the purchase of this product. So, why should you exfoliate your skin? It feels amazing! Exfoliating helps to get rid of dead skin cells, leaving your skin feeling smoother, and it helps in increasing your circulation and helps to get rid of toxins and waste from the body. Taking care of yourself should be high on your list of priorities as managing your emotions is vital-- Dr. Dressler even dedicated an entire chapter in the Dog Cancer Survival Guide to Emotional Management. Also, there is such a thing as caregiver stress, and there's a great article on the Dog Cancer Blog that you may find beneficial if you, or your loved one, are feeling this way-- here's the link. Dry skin brushing is recommended by naturopaths. Check out the LONG list of nourishing, natural health and beauty benefits you’ll experience >>> Cellulite treatment and smoothing, anti-aging treatment, skin bump removal, dry skin treatment, self-massage, support for lymphatic and circulatory systems, gentle exfoliation, holistic skin care, adrenal support, skin stimulation and brightening, natural detox support, reduction of puffiness and inflammation, protection of skin barrier, soap-free cleansing. Our dry body brush set includes 4 specialized brushes. 1 exfoliating body brush, 1 cellulite and skin massager, 1 combo detox brush, and 1 face brush. Our durable dry brushing set is made of high-quality materials that reach all parts of your body with ease. Our eco bamboo has a higher compressive strength than wood, brick, or concrete and a tensile strength that rivals steel. Its high-quality, 100% natural boar bristles have minimal shedding and few to no dark hairs. The natural bristle body brushes fit snugly into a long, detachable handle, allowing easy reach of areas like back and legs and ultimate versatility. When you do business with us, you get a company that supports your inner and outer beauty. Expect premium packaging and materials, and great customer care. You can also look forward ongoing education and inspiration with video tutorials, tips and resources to support self-love, healthy habits, and wellness. 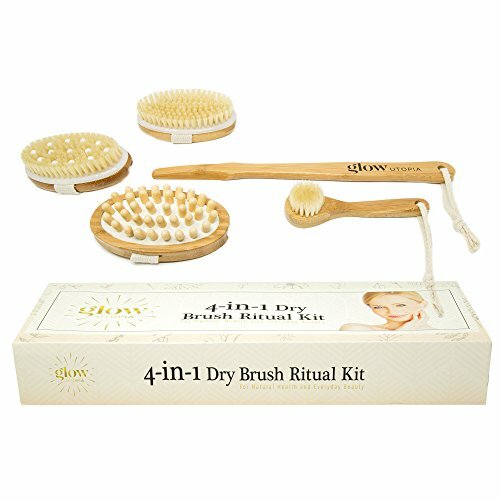 Ready to try dry brushing but still not sure if you'll like it? Already a dry brush fan? Either way, you're covered. We offer a zero-risk 14 day replacement promise + a 90 day full warranty. Order today and give yourself the gift of glow! A HIGH-QUALITY KIT YOU CAN LOOK FORWARD TO GETTING AND GIFTING >> Many dry skin brushes shed too much, or even arrive with cracked wood or plastic parts. Our eco bamboo has a higher compressive strength than wood, brick, or concrete and a tensile strength that rivals steel. Our high-quality natural boar bristles are a traditional Asian beauty secret and contain few to no unsightly black hairs. We inspect each and every kit to help ensure quality upon delivery. 3 BRUSH HEADS TARGET DIFFERENT PROBLEMS >> If you're dealing with irritated, dry, dull skin, frustration caused by preventable signs of aging, or skin texture issues like cellulite or skin bumps, you need serious options. While most sets only contain 1 or 2 brush types, our kit features 3: 1 Exfoliating brush, 1 Lymphatic and Cellulite Smoothing brush, and 1 Ultimate Detox head that combines massage nubs with the exfoliating power of boar bristle. The included face brush = 4 brushes in 1 kit HEALTHY, NATURAL GLOW JUST GOT EASIER >> Our light, 13.25 in. handle stays in place with gentle press. Use any head with or without detachable handle for superior accessibility and maximum options. Light and compact, the kit enables easy reach of ALL body parts, including back, feet and legs. Take it apart and our natural skin brush set is travel and storage friendly. WE EMPOWER YOU, INSIDE AND OUT: It's simple. Self-Love + Health = Beauty. Our US brand is created for women by women. Innovating the BEAUTY-AS-MEDICINE MOVEMENT, we see body brushing as a multi-tasking, self-love ritual that optimizes your skin, health and self esteem. What dry brushing is: Dry brushing is the ancient practice of scrubbing totally dry skin with a dry, stiff bristled brush before showering or bathing.To dry skin brush correctly, use brushes on TOTALLY dry skin. FREE 14-DAY REPLACEMENT PROMISE: Life isn't perfect but your skin should be. That's why we offer a risk-free, 14-day full exchange promise. If your kit arrives in less than perfect condition, we'll replace a part or the entire kit, on us. We also offer a 90-day full warranty. Get ongoing education, product tutorials, and support on our GLOW UTOPIA Facebook page. Our kit includes a "Dry Brush 101 How-To Guide" and our "Super Simple 3-Step Ritual" to help you get started right away.